Arriving back from Sukhothai I spent another night in Bangkok, before heading to Kanchanaburi with Yindee. Me and her met up and went out to The Rock Bar in the Siam area, which was quite but fun, there was a couple bands playing doing good covers of a lot of Grunge and Alt-Rock songs from the ’90s so I was very happy! I also stayed more centrally this time, at a place called Cozy Bangkok Hostel, which is near the Train Station and about 25 minutes walk from the MBK centre. 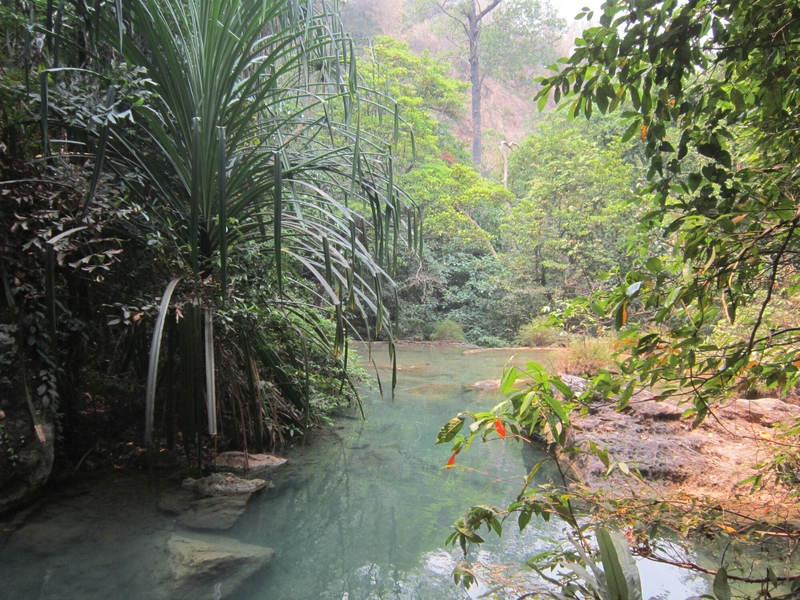 So Kanchanaburi. We headed there by bus from Bangkok’s Southern Bus Terminal, which is fair way out from the centre of Bangkok (we got a meter taxi there). It’s not too long a journey, between 2 to 3 hours. You can get the train too but timing didn’t work our for us so we opted for bus. First night we found a great Vegetarian Restaurants called ‘On’s Thai Issan Vegetarian and Vegan Restaurant’. It does some really good food! We actually ate there again the next day too! Afterwards we went to the Blue Jeans Bar, a Rock Bar my friends Dylan and Amanda (see my posts from Dalat Vietnam onwards and Cambodia!) had recommended to me and it was a cool place, there is a live band doing old rock covers which is the main reason to drink there (apart from, you know, actual drinking). I will mention that unfortunately Kanchanaburi is one of those places with a big bar girl scene on the main strip, so whilst I definitely recommend going there just be prepared to see lots of sleazy old white men accompanied by much younger payed for women. 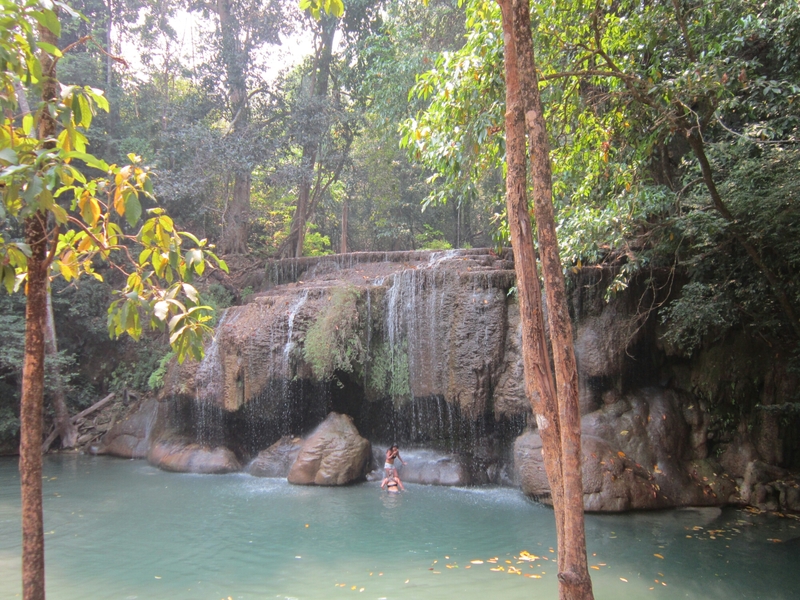 Anyhow, ignoring that there is for me 2 main reasons to visit Kanchanaburi – Erawan National Park and World War 2 History. Second day we set off by local bus to Erawan Waterfall’s. It is a Waterfall with 7 different levels, and we took the to walk up and see each one, which was pretty exhausting but worth it as we saw some very pretty sights! There was a lot of people there enjoying the falls! We caught a very crowded bus back, the last one is at 4:30pm but by 3:45pm all the seats were full (lucky we got some!) and everyone else had to pile in wherever they could. So not that different from the public transport at home in England really! 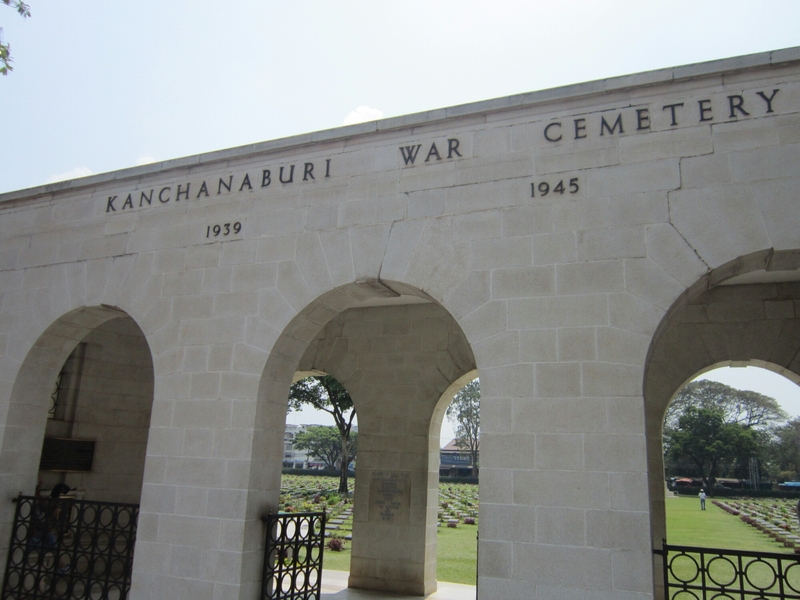 Next day we visited the Kanchanaburi War Cemetery and the Bridge On The River Kwai, before returning to Bangkok that evening. 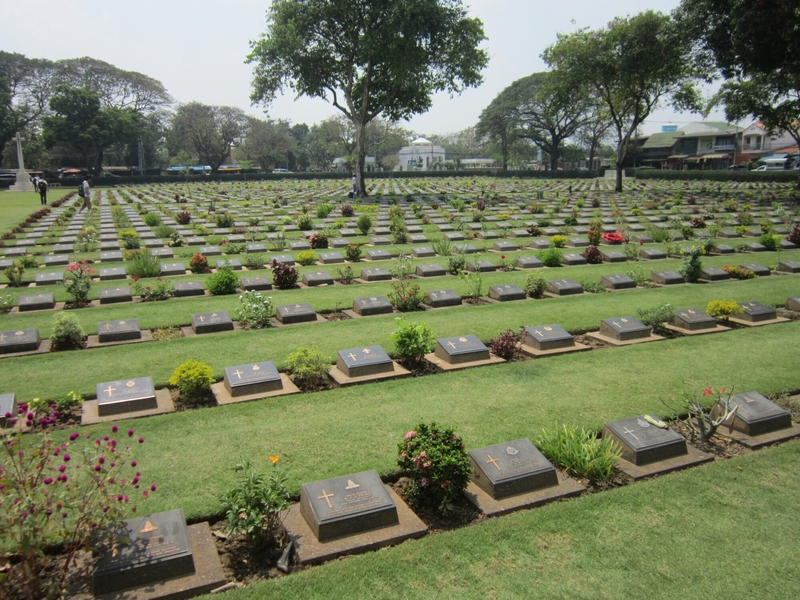 The Kanchanaburi War Cemetery is the final resting place for just under 7000 British, Australian and Dutch POW’s who died during the Second World War, having been put to work by the Empire of Japan on the ‘Death Railway’, their project to connect Siam to Burma during the war. I walked around for awhile and read some of the messages the gravestones and the information provided in the cemetery. Very moving, it is important to remember the sacrifice of these people and all the suffering they endured. 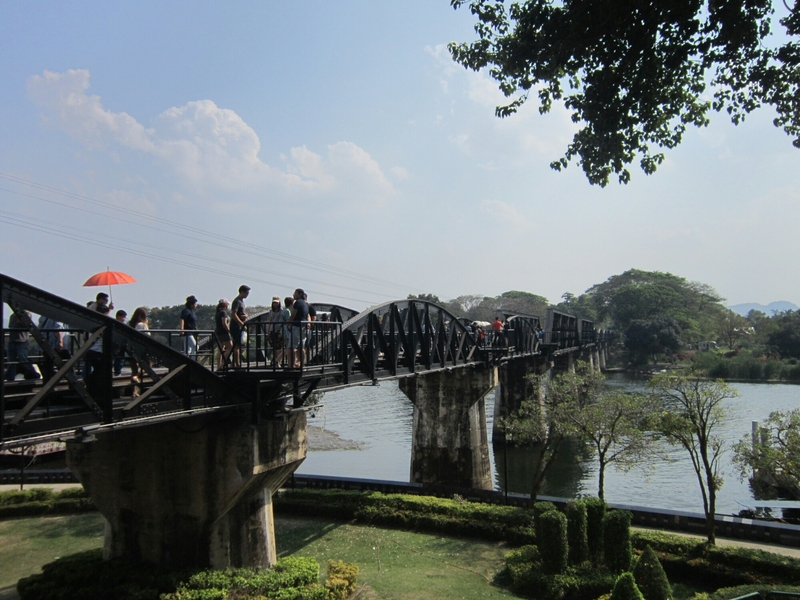 After this we walked to see the Bridge Over The River Kwai, the bridge that is the most famous part of the ‘Death Railway’ and the inspiration for the fictional novel and film. 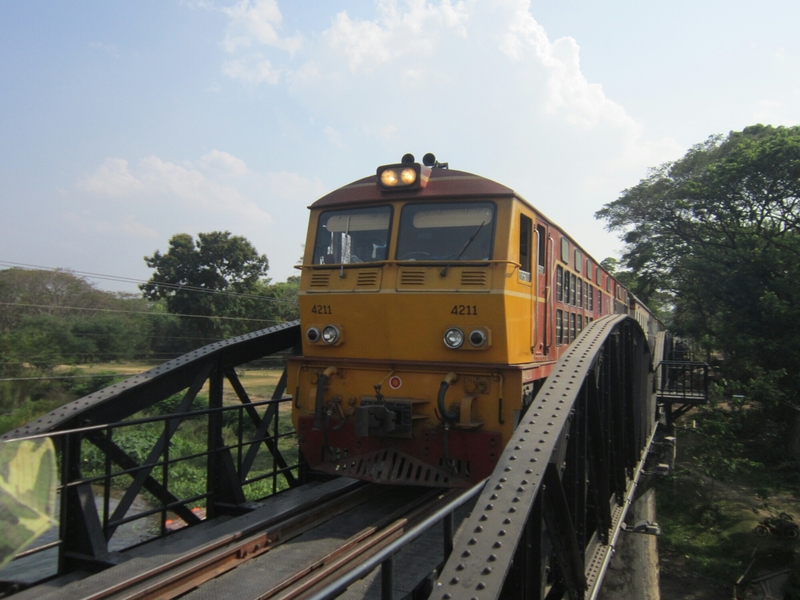 You can walk across the bridge, in fact we also stood on the side at one point as a train crossed! The bridge has of course been rebuilt since the original, Allied bombing destroying parts of it and so forth. After this we headed back to Bangkok, where I spent one more night before heading south! Very interesting post! I’ve only been to Bangkok (you can read about it here: http://traveluxblog.com/bangkok/) so far and totally loved it. Can’t wait to explore more of Thailand!